\r\nI would like your thoughts and nominations on who you would like to see as Moderators on JoeDios. \r\nI am thinking we can have 3 moderators, so no one has to shoulder the burden alone, and the three can discuss issues as a group. \r\nPlease reply to nominate someone (even yourself) and give your reasoning. If the person is already nominated, post with your support. You can nominate or give support to more than one person. Our goal is to have a happy, friendly, creative site where people feel safe and free to share their art. \r\nSonneilon and Vespapilot have my vote. 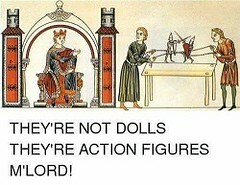 \r\n"They\'re not dolls, they\'re Action Figures! I do not play with toys, I take diorama photographs!" 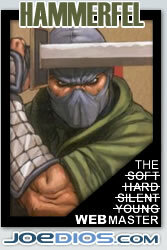 \r\nMike T: Mike is a GI Joe legend who\'s been known throughout the community for decades. He is fair, level headed, and an all around good guy. He has not been involved in any past factional disputes here and would be best for avoiding drama. \r\nScarrviper: Once again, Scarr is a fair, calm, and straightforward guy who can be trusted with maintaining the peace on this site. He has been here for a very long time as well, and would be another good choice for avoiding needless conflict. \r\nNekoman: It is not very humble to nominate myself, but I do so in the case that the other two are not interested. I would take a very relaxed approach as a moderator and only intervene when it\'s clear that a rule breaker has become belligerent. Let\'s talk Joes! Stop by my blog! \r\n	Hell of a coolness! Thank You gijoeiwasthere, but I think I can\'t accept Your vote also due to the different time zone I have in Italy. \r\nIf friend Hammerfel and You all accept this fact I\'ll make me available for "elections". \r\nI had to choose on difficulty only 3 of You because all the named guys are fine for me. \r\n	My troops are ready for inspection. All of my joes are modern just fyi..If you guys need to find me or have any questions, find me on FB. Sean Williams.I have nothing to hide and will happy to tell you more about myself and my involvement in JDs and Diowarriors.